Wolves are members of the Canidae family, which includes dogs, foxes, coyotes and jackals. Members of this taxonomic family, called canids, date back to the Oligocene and Miocene eras, making them one of the oldest groups of carnivores still in existence. Qualities found throughout species in the Canidae family include an acute sense of smell and hearing, physical endurance and deep-chested bodies with elongated muzzles. Wolves are medium-sized canids found throughout North America, northern Europe and Asia. Weighing between 60 and 100 pounds, wolves are familial animals that live in packs usually of around eight or nine members, though packs can grow as large as 30 individuals. An alpha male and female lead and organize the pack, which also includes their offspring. Pack territories can be small, around 20 square miles, or as large as 1,000 square miles in less inhabited areas such as northern Canada. The dog group includes several species of wild dogs as well as all domesticated dog breeds. The dingo (Canis dingo) and the African wild dog (Lycaon pictus) are free-roaming dog species that are closely related to wolves both in social structure and wild nature. The domestic dog (Canis familiaris), conversely, was one of the first tame animals. Humans have bred hundreds of subspecies of Canis familiaris, from the pint-sized Chihuahua to the massive great Dane. These subspecies, however, are far less territorial than their wild cousins and may have a difficult time surviving in the wild. Foxes (Vulpini) are some of the smaller members of Canidae; a typical adult weighs between 7 and 24 pounds. Known for their adaptability and resourcefulness, foxes can thrive in a variety of habitats from dry deserts to open grasslands and towering mountains. Foxes are solitary canids, preferring to hunt rodents, rabbits, birds and other small game solo. Red foxes (Vulpes vulpes) mostly interact during the winter months when mating occurs. Coyotes (Canis latrans) are a behavioral mix of wolves and foxes. They form strong family groups and communicate with a series of distinctive calls and howls much like the wolf. Coyotes are also highly adaptable canids much like foxes; their habitat spans North America, even encroaching on urban areas, and coyotes will eat almost anything they come across including rabbits, rodents, fish, deer, frogs, grass, livestock and even pets. Jackals inhabit Africa, Asia and southeastern Europe. Nocturnal in most areas, they are fiercely territorial canids and will not hesitate to defend their marked territory. 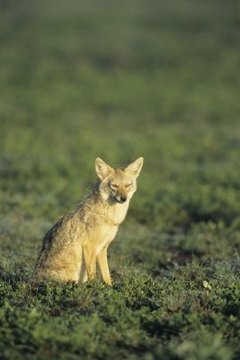 Stealthy, silent hunters, jackals prefer to hunt individually, which provides them with a better opportunity to ambush their prey: small mammals, birds and even snakes. When they’re not hunting, jackals, much like wolves, live and travel in packs of 10 to 30 individuals.